Ang "mahiwagang black box" - ABS-CBN TV Plus is a digital tv that provides free tv channels to watch your favorite teleserye with digital clear recepcion of the signal. This new product by ABS-CBN is currently being advertised by the Pop Star Princess, Sarah Geronimo and Coco Martin as the product commercial models. Can't stop the popularity of this magic black box that turns your daily teleserye viewing into a digital clear and comfortable high definition drama for FREE. For those of you who are looking for information online on where to buy the digital box, here is your chance. ABS-CBN has provided their own online store where you can see more information from specification, price, subscription, inclusions, included channels, customer support and service, shipping and ordering, toll-free hotline telephone numbers, tv compatibility, signal and frequency availability and areas covered in Manila and provinces. Today, you can buy this modem box at any SM Stores and groceries nationwide with a discounted price of PHP 1,499 instead of Php 2,500 from the first offer. 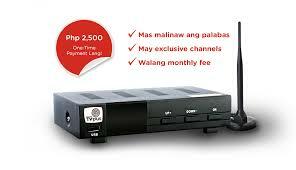 This digital box is offered at an affordable, one-time payment price of only P2, 500.00 per unit. There is literally NO monthly fee. It also includes 1 ABS-CBN Mobile prepaid SIM with a load of Php 50.00 available for regular cellphone / mobile phone use for text, call and other related services. It is also very much compatible to almost all types of television, imported or locally manufactured for as long as it has an (A/V) audio-video input jack. Comes also with 4 additional exclusive channels without additional cost that you can watch too! Please note that delivery takes 6-8 business days from date of order due to bulk orders but a free shipping is offered nationwide. There are basically just 3 different ways with which you can get a hold and buy this magic digital black box for your television to turn into a daily digital viewing instead of analog outdated viewing. Mag-text sa 23661 o tumawag lang! There are currently so many accredited dealers and sales agents who are authorized to transact sales of the digital tv box by ABS-CBN in Metro Manila and major cities in Luzon and Metro Cebu area. So far we have a shortlist so you won't get scammed. Just like your ordinary digital cable box or modem, the ABS-CBN TV Box offers buyers and viewers the chance to watch different custom viewing shows and programs using local channel frequencies. Apart from that, the bonus is you can watch latest and recently shown cinema dramas and movies at very low cost using the ABS-CBN mobile plus. How to do this? Watch the daily commercial on Channel 2 which is featured especially during primetime bida shows like Ang Probinsyano and La Luna Sangre or A Love To Last.